Whether you were present this morning or not, I post the liturgy as a reminder of our commitment to Christ this morning. If you were unable to join us, I invite you to prayerfully read through this liturgy, renewing your covenant with Christ and reminded of Christ’s unceasing commitment to us. Let us give thanks for all of God’s mercies. You have been gracious to us through all of the years of our lives. You have given us life and reason, and set us in a world filled with your glory. Join me this morning in thinking about your family. Think about your kids, your grandkids, your great-grandkids if you have them. Then think about your brothers and/or sisters, your aunts and uncles, your parents. Remember back to your grandparents, to being in family when you were a kid. What do you remember most about times with those family members? I remember the warm Christmases and Thanksgivings Dana and I have hosted in our home. I can recall watching Jack Jack learn to walk. I think of warm nights by the fire in our living room, watching a family movie. I have many warm, fuzzy memories of family. I’m sure you do, too. I remember hosting family and friends one particular night in our home in Macon. Our house had an open floor plan downstairs, with the living room, dining room, and kitchen all flowing together with large, gracious, archways separating them. Off the kitchen, in the back of the house, was a halfbath. This little architectural tour of my home is important for what comes next. On this particular night, I was turned, with my back to the fireplace, talking with my dad. The children had been running around screaming, as children are wont to do, and so I had mostly tuned them out. But at this particular moment, I happened to turn around. What first caught my eye was a line of unbroken toilet paper running from the half bath in the back of the house, through the kitchen, through the dining room, around the stairwell and into the living room. There, standing in the living room, shrieking with joy, was one of Jack Jack’s friends, actively throwing the line of toilet paper into the fire place. Such funny memories are the stuff family stories are made of. Family forms a unique bond, a deep connection, one that we rightly identify as a covenant. Family forms a covenant, one that binds us together through the warm fuzzy memories, the funny stories, and even through the cold, hard, memories. I have experienced much of the latter. Those cold, hard, memories have a way of freezing themselves on our brain. I bet you can think of many yourself. The cold, hard, memories begin with my brother Chris. When I think about Chris, I initially recall good times growing up together. As kids, we had a great time playing together with our blocks and our toys. We’d have these huge elaborate forts, wars would break out, hospitals would be constructed: you know, typical boy stuff. We fought quite a bit, but we would always come back together and play, enjoying what we had. Times changed, though, and we grew apart. For a time, while Chris was in Iraq during the war, we grew closer. We sent letters back and forth and it helped. But when he came home, things were different. Chris and I didn’t talk to each other and neither of us had much relationship with my parents. Not long after he was gone to war, his relationship, already poor with my parents, seemed to die. And my relationship with my parents fell apart. For a few years, none of us really talked to each other, with months going by at a time without a conversation. My nuclear family, the one that had raised me, seemed to cease to exist. Chris, my parents, and I lost relationship for a bit. On my end, feelings were hurt and I found myself feeling increasingly bitter. The ensuing decade brought with it only more reason to be bitter, angry, and resentful, leading to great strain in my relationship with the family who raised me. Maybe you can relate. When I first asked you about family, my guess is you first thought of warm fuzzy moments with family, like my memory of playing with my brother during our childhood years. Perhaps you remembered a special Christmas, or birthday party, or the memory of a favorite aunt or grandfather. Whatever the case, my guess is memories of drama, of difficult moments, weren’t far behind. Family can be the most wonderful, joyful, thing in your life and can, without warning, become the most painful, difficult, gruelling aspect of your life. Family is more than the precious moments around the Thanksgiving table, more than the happy moments of graduations and weddings, it’s also the yelling, crying, screaming, moments that happen in the kitchens and bedrooms. It’s the phones that don’t ring for years becuase relationships are strained. It’s the family reunions that cause war to break out when Uncle Fred reminds your dad how he ruined the family. People become estranged, relatives stop talking, children cut off parents and parents rebuke children. Feelings get hurt, bitterness ensues, and the relationship just gets more divided. And yet, family forms a covenant. When you’re born into a family, you’re a part of that family forever, whether you mean to be or not. Even when we try and leave our families and run away, they’re still a part of who were are. Family has a certain power to keep us connected, to cause us to keep coming back together, even when there’s pain, even when there’s bitterness, even when the history of drama is long and deep. No matter how ridiculous the behavior, no matter how difficult, they remain family. For a time you might cut someone off. For a time you might even reject them. For a decade, until only recently, that was the story for myself, my parents, and my brother. In a family, whether it’s a good family or a bad family, whether it’s a loving family or even a hateful family, there’s a connection that keeps drawing you in, keeps calling you back, that seems inescapable. That’s because family forms a covenant relationship. Covenant is the point of this scripture. Simply put, covenant means a contract, but it’s more than just a contract like you sign when you buy a house or a car. A covenant is a holy binding together among many individuals. In a family, a covenant comes automatically when born into the family, and in this scripture, covenant came automatically for God’s people. When born into the Israelites, one was born not only into their nuclear family, but also into the family of God. And that covenant, the most important covenant, demonstrates that God desires relationship with his people. God, the God of the universe, the God that has every right to stay high and lofty, desires to be family with us. Out of that desire, God established covenant with the Israelites, made them God’s family, and then expanded that covenant, through Jesus, to include us. We’re God’s family. And not just in the touchy-feely way that we usually talk about. Being God’s family is more than the precious moments around the Thanksgiving table, more than the happy moments of graduations and weddings. Being God’s family means that God enters into all the mess of human family relationships: the yelling, crying, screaming, moments we mentioned before that happen in the kitchens, bedrooms, or even at church. Being in God’s family means that when it’s we who are the problem, when we don’t call for years, when we cause war to break out at family reunions, when we hurt people deeply, when we’re the cause of evil in the world, God still reaches back in love. That’s the kind of family we have with God. God’s not the favorite uncle that always gave you the special gift, nor is God the crazy Aunt who acted unpredictably, nor is God the vengeful, selfish, mother who hurt you deeply; God is, instead, the patient grandparent who always reached out in love to you, or the wise great-aunt who welcomed everyone into family, no matter how much others had hurt her. God is the one always reaching out for relationship, no matter how much we may have hurt God, no matter how much we may have wronged God. God is that family member you’re thinking of right now who always loved you unconditionally. When things are good, just like when things are good in our families, it’s easy to forget how remarkable it is that we’re in God’s family, that we’re loved by God unconditionally. God’s unconditional love has the power to transform, to renew relationships, to heal wounds, because, in God’s family, love never fails. Human families may fail. I know in my own experience my family has failed greatly. Relationships, too, fail all the time. Maybe your family is awesome and has no problems, but friendships break down, business partnerships fail, contractual relationships break, leaving us feeling that no relationship is ever truly permanent. Covenant, that holiest and most sacred of contracts, is supposed to undergird all relationships. Consider how many neighborhoods have a covenant. Or that when we marry, we do a covenant ceremony. Or, if you have a legal mind about you, consider how closely the marriage ceremony resembles a property contract: to have and to hold is a good example. Covenant is supposed to undergird all relationships, even the contractual ones. And yet, covenant seems, at some point, to break under the strain of bitterness, anger, misunderstanding, resentment, jealousy and all kinds of evil. And yet, the covenant God makes with us, the covenant we entered into at our baptism, never breaks under strain. It never fails. It never ceases to exist. Families may fail. Relationships may fail. Contracts may break. Evil may define too many of our relationships, but God’s covenant relationship with us never fails because God loves us, deeply, and God’s unconditional love never fails. Because we have a God who loves us unconditionally, we are called this morning to renew our commitment to relationship with God. Moses tells the people, in our scripture this morning, that every seven years, all people are to be reminded of what it means to be in relationship with God and of their commitment to God. The covenant was so important, that the people must pause to be reminded of God’s commitment to them and to recommit themselves to follow God. This morning, we will follow the example of Moses. That covenant, the holy binding of us and God into family, comes with responsibility and joy. While God may never fail in his covenant obligations, we sometimes do. That’s why, this morning, we will remind ourselves of that responsibility, the commitment we make to serve God, to love God, to seek God, with our whole hearts, our whole minds, with all that we are. Part of the service following this sermon will be an opportunity to come forward and recommit yourself to God. During this time of the year when we’re often thinking about making new commitments, making resolutions, it makes the most sense to me to make the first resolution a recommitment to the God who makes all other resolutions possible. Even if you feel you enjoy a strong relationship with God right now, it’s always good for the soul to recommit. We will also, while recommitting ourselves, be reminded of God’s commitment to us. This covenant, this holy binding into family, isn’t just about our commitment to God. God has made commitment to us: that we will always be family, that we will always be welcomed by God, that we will always be in relationship with God, no matter what we do, no matter how long we don’t call, no matter how much yelling we did at God in the kitchen, no matter what. And unlike human commitments, God never fails. So let’s join together, this morning, beginning 2018 by recommitting ourselves to God’s family, represented by our church family; our family whose founder and head is our brother Jesus Christ. Come, bring yourself to the God who loves you unconditionally, whose relationship never fails. The Christian life is redeemed from sin and consecrated to God. Of which Jesus Christ is the mediator. He sealed it with his own blood, that it might last forever. And gather at the Lord’s Table. To renew the covenant that binds us to God. Let us make this covenant of God our own. Give yourselves to him, that you may belong to him. Give it all to your pleasure and disposal. Christ will be the Savior of none but his servants. He is the source of all salvation to those who obey. Christ will not accept anything except full consent to all he requires. Christ will be all in all, or he will be nothing. Confirm this by a holy covenant. In searching your hearts whether you have already freely given your life to Christ. Consider what your sins are. Are willing to choose them all. Be sure you are clear in these matters, see that you do not lie to God. So you can keep your promise. Trust not your own strength and power. And you have dedicated yourself to God. With God’s power, never go back. 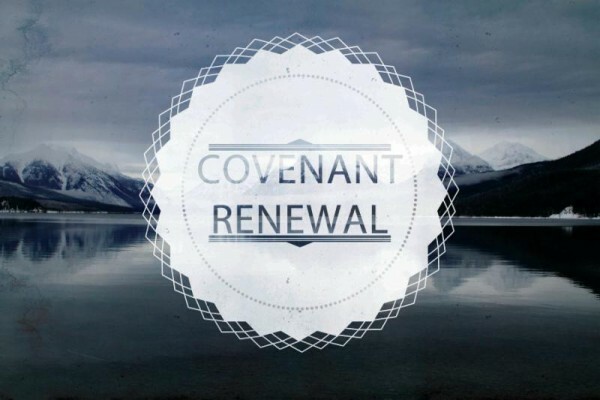 And last, be then prepared to renew your covenant with the Lord. If I turn to you with my whole heart. Against your will, I have turned my love toward the world. In your power, I will watch all temptations that will lead me away from you. Unable to stand before you. I here acknowledge you as my Lord and God. To serve you in holiness and righteousness all the days of my life. And sincerely join myself in a covenant with him. I renounce my own wisdom, and take you for my only guide. I renounce my own will, and take your will as my law. To take my lot with you as it may fall. That neither life nor death shall part me from you. I do here willingly put my neck under your yoke, to carry your burden. All your laws are holy, just, and good. If any falsehood should be in it, guide me and help me to set it aright. Whom I from this day forward shall look upon as my God and Father. Who by your almighty power have turned my heart from sin to God. O mighty God, the Lord Omnipotent, Father, Son, and Holy Spirit, you have now become my Covenant Friend. And I, through your infinite grace, have become your covenant servant. And let the covenant I have made on earth be ratified in heaven.